My "resolution" Is in the chat I pasted from TWC customer support. There's something wrong in my router. I disabled routing and [TOS Violation] works like a dream again at 112 Mbps. But of course, it's on me to physically go to the local TWC store to pick up new hardware. So I have no WiFi connectivity for any other device because by the time I get off work, the store is closed. I'm looking for a good router to buy on my own so I can take a dump on this one and drop it in their box. Sheesh. No way man. #MURICA...well at least northeast is not like that. Should've seen when I used to work for Verizon Wireless. 600Mb/s symmetrical. It's was dope. Issue is still going on. 4th tech visit will be tomorrow. I've spoken on the phone with over 6 individuals and had 6 different online techs attempt to assist. Anyone smarter than me see anything wrong here? Or can you halp me figure out what command/tool to use to trace my routes? I don't know enough about enough to say it's a routing issue for sure. But I can run a speed test on a San Marcos TX server and pull 117 Mbps down, then hit a San Antonio and get 12 Mbps down. I jumped in the 3rd ID server tonight and had a 54 ping. I immediately thought I was good so I went to scrim...got in IK server and I have a 250+ ping. Jumped in i9 and also a 200+ ping. Ran Tracert's on all 3 servers to compare routes. Also pings for what it's worth. Easy to tell which server is which based on my lag experience. Issue resolved. So...what the heck is going on?? And why would it still only affect me during evening time?? I am reading this stuff, I just don't know what to say. You say the problems only happen in the evenings? Have you asked any neighbours who their provider is, and what's their experience with them? 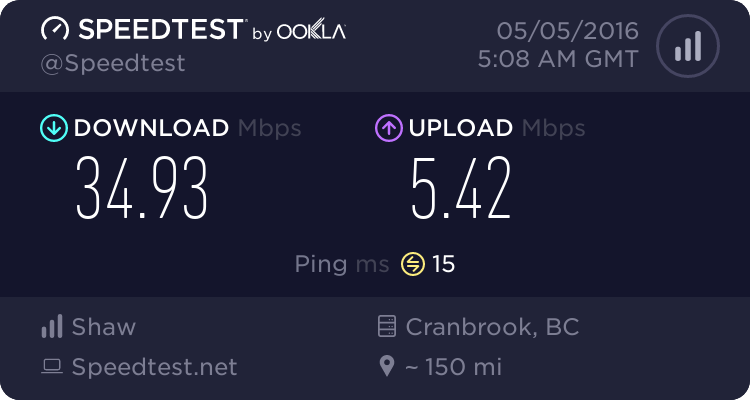 I'm guessing everyone in your area will be having the same issues....at a time when the kids and parents get home and everyone's on the internet. They sent out an army of techs the other night and were able to recreate the issue outside of my house, and down the block. Neighbors don't experience the issue because I'm the only gamer around. I never would have noticed the degraded speeds if I were just on facebook or news sites. I put the TWC device in Bridged Mode, and then hooked up my own wireless router to it to enable WiFi for my house. I cannot recreate the degradation once my device is in Bridged Mode, even with a separate device connected in order to utilize WiFi.